Simply mirroring the North Sea’s existing fixed accommodation platforms and helicopter transfers has been widely discounted on the grounds of cost effectiveness. Crewing a single platform is a very different prospect to maintaining a field of multiple turbines geographically, practically and economically. Noting this, Houlder proposes an Offshore Support Base (OSB) vessel that recreates the convenience of port facilities – but offshore. To do this requires a highly stable platform combining quality accommodation with flexible working spaces, multiple crew transfer methods and the ability to assist directly with operations. Such a solution delivers the quickest and most cost effective access to turbines – with the flexibility to accommodate both routine maintenance and unplanned events. It keeps maintenance crews within the windfarm and is able to move them around within it. There are several competing concepts but the starting point has to be a highly stable platform with a large and versatile deck plan. Uniquely, Houlder has been able to turn to a well-known and proven design from its Oil & Gas heritage to deliver this with high crew comfort and excellent operability. The DSV (Dive Support Vessel) Orelia hull design has a long history of providing stable, safe and highly operable diving support. Its unique form provides superior seakeeping to that of a standard monohull vessel with motions comparable to Semi-submersibles in North Sea conditions. Using a proven, highly stable design significantly will improve the comfort levels onboard for future windfarm maintenance crews. 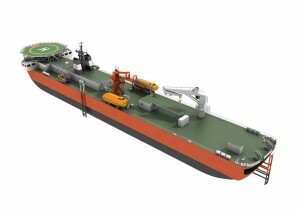 In typical North Sea crew transfer conditions, the Orelia hull design limits roll to +/- 1 degree. This means a straight-forward walk to work personnel transfer system can provide direct turbine access without expensive, complex motion compensating technology. 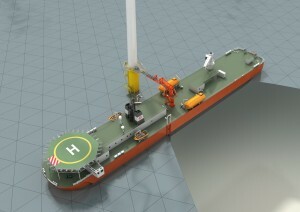 For further flexibility Houlder’s design also provides three docking stations for Crew Transfer Vessels’ and a helipad to maximise deployment and crew transfer options. 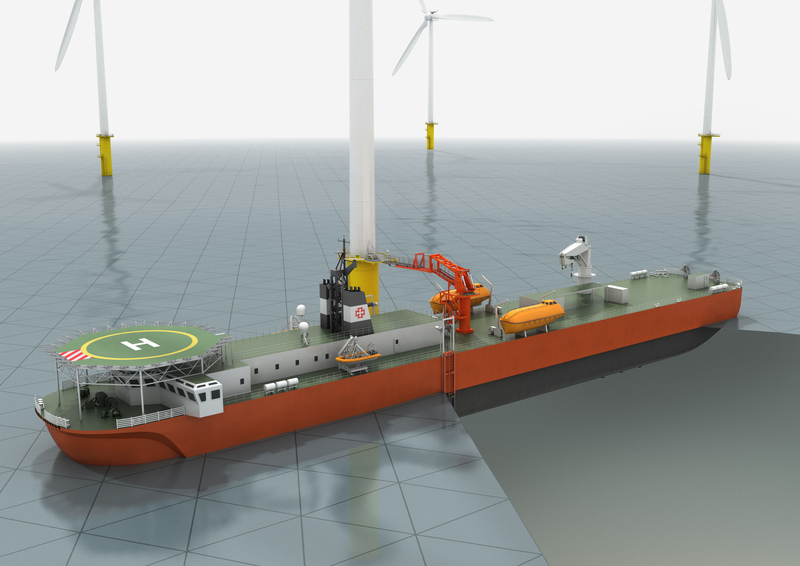 Taking Dogger Bank as an example, it is intended that the vessel will stay in the windfarm continuously throughout the summer weather period. It will be re-supplied by standard supply boats, with the crew and maintenance personnel being changed out as required. During winter periods, when crew transfer becomes more challenging, returning the mothership to port on a 28 days’ cycle proves more cost effective. Facilities are based on the latest offshore Oil & Gas standards including private cabins, wet rooms and project offices. Home comforts include cinemas, gyms and games rooms. The design leaves significant scope for additional client requirements.